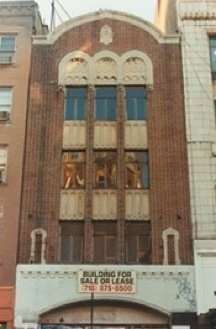 When I took this picture in Sept 95' the Fillmore was for sale. I’m not sure what it is now. Things change so fast in NYC. Maybe Trump made it into some yuppie condo! Gone but not forgotten. 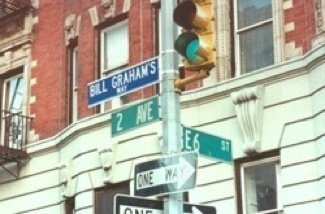 Now called Bill Graham's way. By this time Bill Graham was leaning on one of the guitar amps & crying. He was sad that all this was going to end and told us how he felt. We listened and all agreed that it was the end of an era. The music industry was changing. There was not enough money in filling a 2600 seat theater any more. Now all the big acts were playing at 20,000 seat halls like Madison Square Garden and getting ten times the amount that they used to get at Grahams Fillmore. Graham could no longer afford to keep the Fillmore opened. Some have tried & failed to reopen the old place hoping to recapture the magic but times have changed. After the last notes of the last song the doors in the back of the theater flew open and the sun came shining in. The hall was filled with the sound of the Youngbloods "Get Together" as we walked towards the light. It was a moment that I will never forget. Kind of cosmic. We went into the Fillmore in the dark of night and emerged transformed in the early morning daylight. It was a beautiful summer's day in New York City. We staggered out at went next door to "Ratners" for breakfast. Finally at about 8:00AM we made our way down into the subway and took the train back to Canarsie. We did some serious growing that night.